Once a fortnight in our department we have a spare 10 minute briefing slot, so a couple of years ago, our then TLR holder introduced a teaching and learning briefing session to share good practice. These are usually topic based for upcoming topics! Today’s, however was a feedback on 100 outstanding maths lessons, by Mike Ollerton. A few of us were tasked with reading and trialling out a few ideas. One colleague had tried out the cuboid and prism volume, a lovely activity of folding a piece of paper length ways into a cuboid (or bigger edged prism) and using the open end on square paper to find the area and then volume. Another tested out idea was an angles activity, again starting with a piece of paper, following some rules for folding to provide more than 20 angles to work out using angle rules, or to measure. What’s even better with these is the lack of time needed to prepare resources! 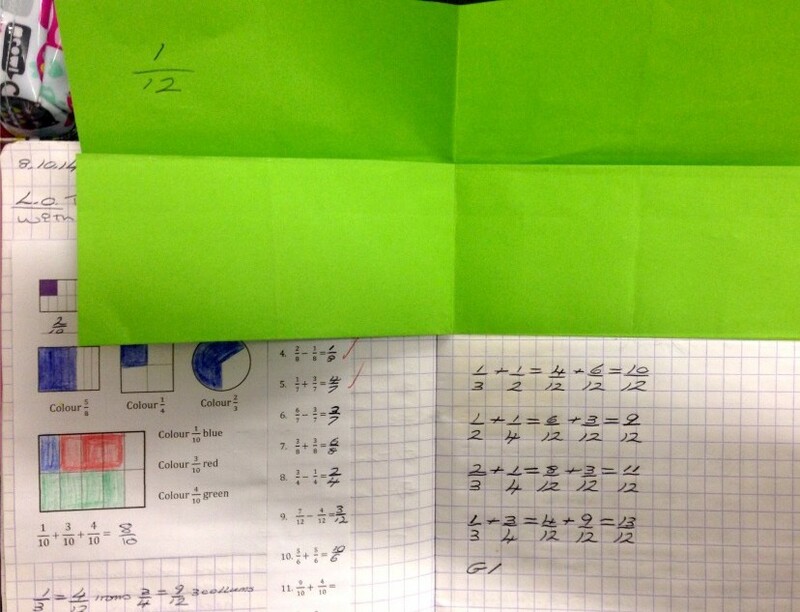 The ideas I tried out included another paper folding activity to help adding fractions with different denominators. It was a great way of helping pupils understand how to find a common denominator and why, especially with my lower set group. I also tried out partition and product – a number investigation which was easily adapted for a lower set year 9 group and top set year 7 by how much information was given to the pupils to start with. The final idea I partly used was area of 20cm2, but instead of using area, I found a similar idea using perimeter of 12cm. It worked really nicely with the year 7s, particularly as I could use the visualiser to display some ideas, which then prompted others to find more interesting shapes. I would really recommend the book. It does what it says on the cover: Outstanding Ideas, which come with the bonus of being able to use without time needed to prepare (or photocopy) resources.